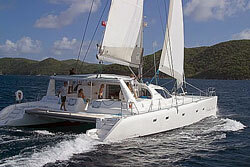 Why rent catamaran instead of sailing yacht ? Catamarans are a great choise for sailing. Why? Well, we'll bring out some facts about catamarans; first of all these vessels are much larger, thus more comfortable with roomy cabins and large deck. They are pretty stable for they are two hull vessels which means the catamarans do not heal a lot. This is very important, specially for those who have never sailed before and feel a bit uncomfortable on board. Therefore, if you plan your vacation on board and you feel a bit uncertain about your choice, we suggest you charter one of these marvellous vessels to make your journey comfortable and unforgettable. You won't have to worry about healing, or walking the unsafety and slippery deck, for these are more safe than monohulls. It is the perfect boat for safe sailing and stylish navigation. Advantages are endless. Besides, though these boats may seem slow, however, they are faster than the boats of the same length. Furthermore, with catamarans you can approach the coast and bays in short distances. So, there is a great choise for anchorages. Copyright notice: this text is copyrighted by us and it is allowed to copy it only if you clearly indicate our autorship somewhere on the same page together with a link back to our site.